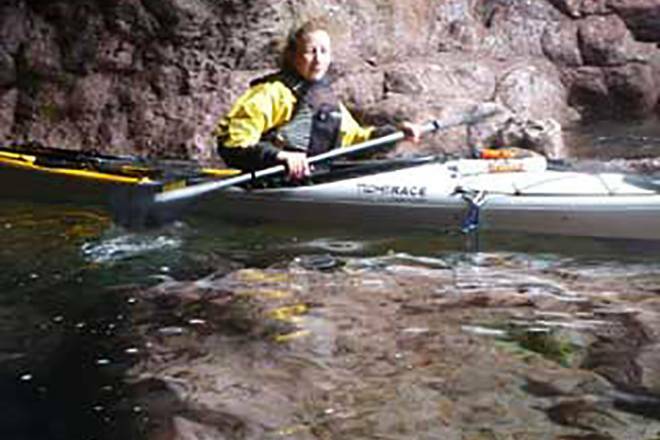 The Xcape is described as an ‘efficient expedition sea kayak for the discerning paddler’. I asked three Xcape owners to give their thoughts on their boats, and here is what they said..
Kayaking background and experience? White water and river background. 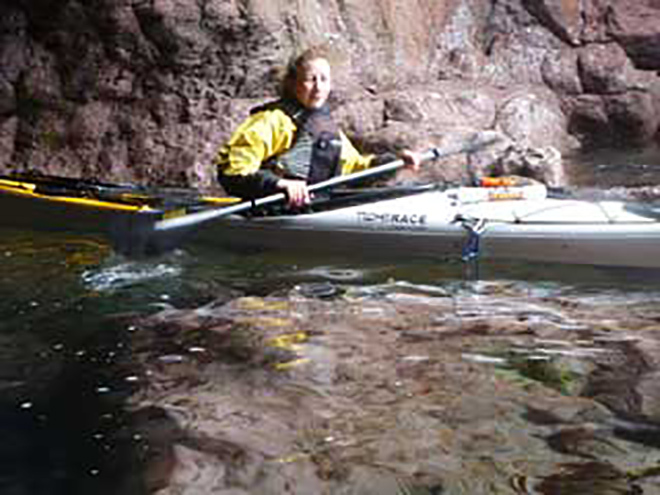 Plus many multi-day sea kayaking in borrowed club boats without skegs! Where do you normally paddle? West and east coasts of Scotland. Why did you choose the Xcape? Having come from a river boat background I was used to boats that are very manoeuvrable. I wanted this characteristic with more stability and comfort than you find in many river and sea boats. Initial impressions? The Xcape as soon as I sat in reminded me of a stable river boat as the lower centre of gravity gives a great feeling of security. Some rogue waves whilst rock-hopping around Stoer in NW Scotland resulted in an unplanned capsize. I rolled back up without a problem, much to the delight of my companions! What about overnight trips? The large hatches make it an easy packing experience with the foredeck hatch being a well thought out little extra. 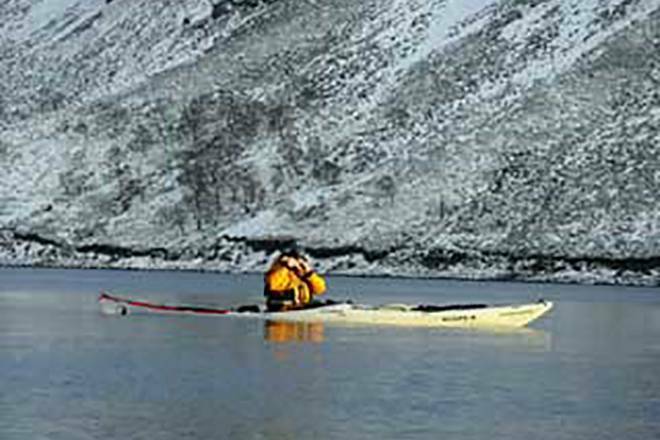 What are your paddling plans for 2012? 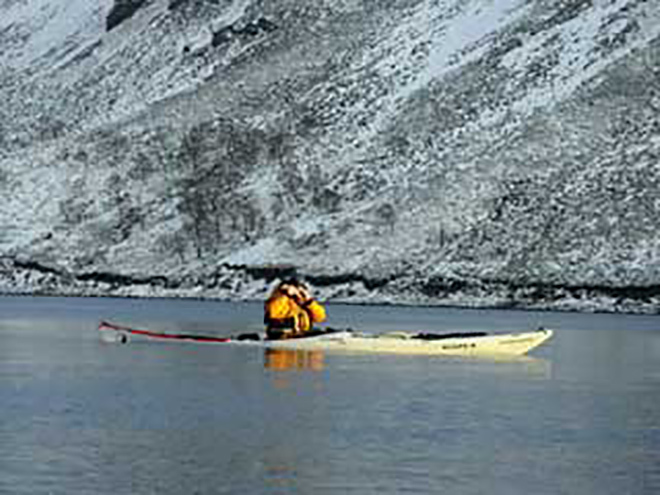 I have been out for a few day paddles in the cold sunny days in early winter. Overall? My Xcape has performed well in both day and longer extended trips in a variety of conditions. I would recommend this boat to both those new to paddling and for those with more experience who like to feel comfortable and secure when things get a bit ‘interesting’. What is the model? Xcape X. It’s got that red and white diagonal slash colour scheme, which may take a little getting used to! About you? I’m a big bloke, 17.5 stone and 6’2″ – I’ve also got a long back, so there’s a lot of me above the waterline. I’ve been actively sea paddling for 17 years. I’ve had a Mk I Capella, a Nordkapp Jubillee and a Quest which I used for 11 years. Where do you normally paddle? Mainly day trips, weekends and the occasional week out on the West Coast of Scotland with trips to places like the Inner and Outer Hebrides. I love the area around Jura, Scarba and the Garvellachs as well as the Sound of Sleat, and Raasay & Rona. Why did you choose the Xcape? I hired one and liked it so much that I literally ended up buying one. The key criteria was maintaining or improving on load carrying ability, and also cockpit space, but without compromising speed and sea keeping ability. Initial impressions? I was very, very impressed. I quite like a bit of bumpy water, but don’t choose to paddle in enormously challenging paddling conditions – this boat does seem to encourage a bit of experimentation though, which is a good thing. Anything you don’t like? I don’t think the colour scheme is in the same league to the coloured quadrants option on other Tiderace boats. I have had to adjust to carrying my splits on the foredeck. The blades on my standard size Lendal Kinetics are just a little too wide for the rear elastics. The foredeck is a better place for them anyway. I can’t see the point of the wee foredeck hatch, I have noticed that it has started to fill with little things like choccy bars, rescue stirrup, repair tape and the like. Flares wont go in, and neither will a VHF. But it doesn’t intrude badly into the cockpit space. The front elastics are placed too far forward to make reading a map placed there practical, so that issue was resolved with the excellent Tiderace specific spray deck with map bungee loops. How about overnight trips? It swallows my fairly heavy kit (I like camp comforts!) with ease, with space to spare for a weekend on Loch Etive, Scotland. The rear hatch is rather smaller than the Quest, and the skeg box intrudes of course. It’ll be a slim thing you pack down past it – and I recommend it’s a light thing! The day hatch is slightly bigger and the fore hatch significantly bigger. There’s about 6 inches of redundant space between the footrest and the bulkhead. Room enough for a dry bag, but I’ve never been a fan of such things in the cockpit. How does it feel to paddle? I enjoy the boat a lot. It’s great in strong winds and confused, bumpy water runs downwind very well in moderate surf waves. I also found it fast compared to the Quest – I find myself generally having to hold back. Like the Nordkapp Jubilee, it also lets me keep at the front of the group, so I’m impressed to have found a fast boat. The hull design provides a wider profile by the cockpit. That said, the boat is only 22.5 ins wide, so only a half inch wider than the Quest. For the “larger paddler” and those with big feet, the Xcape-X certainly gives a lot of cockpit space. The design seems to create volume at, and in front of, the seat. This produces a lovely response in those awkward rear-quartering seas and the boat just lets them roll under, with none of the unpleasant excessive lift. This boat inspired confidence, takes an aggressive edge and never gave any indication of wanting to let me take an early bath either loaded or empty. The knee / thigh braces are truly superb – allowing very positive control indeed, with excellent secondary stability, and this is a significant factor in the overall performance of the boat. The seat and backrest is also excellent, with a nice low seat position. My preference is for a forgiving craft than a highly dynamic one, but neither do I want something rather like a cuddly old Labrador. This boat is dynamic, while also instilling great confidence. The boat seems very neutral, with rather less input from the skeg than I expected but was quite happy running cross-wind (and cross-sea) with or without the skeg. So far, I have found it doesn’t weathercock as easily as I was expecting, but this might just be down to still coming to terms with a new boat and developing a slightly different technique as well as experimenting with trim. The skeg operates smoothly. The fit and build? It works very well for me and is exceedingly comfortable. I suffer a bit of a niggling lower back problem, but stepped out of the boat after 3 hours slogging into the wind feeling absolutely fine, something which hasn’t been the case for rather too many years! The build quality is superb! Flawless in fact. That said, the gel is quite thin and I’ve noticed that although the construction is clearly very strong, the gel will scratch through quite easily. This is a fairly light boat which makes getting it onto a J cradle rack on my own quite easy. Kayaking background? I’d had enough of ferrying my son around and watching from the shore…so a couple of years ago I joined him on the water, found it absolutely as much fun as it looked and I knew after the first holiday in the Sound of Arisaig that I would do it again. And so I did, although Abel Tasman National Park on New Zealand’s South Island with one heck of a storm blowing down the Cook Straits was a bit of a step up. Clearly I needed to up skill! Loch Torridon next and it was AMAZING! Somehow the months slipped by, work, skiing, work and more work I suppose and then an impulsive email to Roddy at Kayak Bute. Incredibly he had a few free days at the end of August last year and he agreed to take us on; Kayaker’s Mum and the real paddler. And this was my introduction to Tiderace kayaks. How does it feel to paddle? Over five days we circumnavigated the Isle of Bute. Atrocious weather seems to follow me around yet in my borrowed Tiderace Xcape and with Roddy’s calm coaching and eagle eye on what I was doing, I felt as steady as the QE2. Force 4/5 winds, lumpy swells one day, rollers the next, then fierce choppy breakers, I was fine because this kayak was fabulous. None of the precarious rolling around that I remembered from other types of craft, simply a boat that steered through everything, did as it was told, felt secure and responsive. This kayak was so different from anything I had paddled before so it could only be Tiderace as far as I was concerned. Paddling plans? I’m not planning on crossing the Atlantic or even going on three week trips, Pikatti (meaning ‘companion’ in Inuit )and I mostly just have days out. For 2012 we’re planning a few week end trips and our very first expedition on the west coast. For this the Xcape is just brilliant. A massive thanks to Andrea, Mike and Lynne, our contributors. Do you paddle an Xcape? Please add your comments below.